We want to start by saying thank you! Thank you for the giving of your time and treasure to support our diocese and ultimately our parish and the Catholic values that we hold so dear. Since the formation of the Diocese of Gaylord in 1971, the Catholic Services Appeal (CSA) has been both an invitation and opportunity to support the programs, services and ministries within our diocese and around the world. 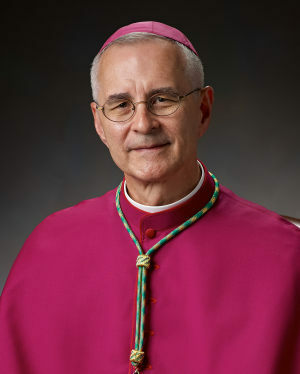 Through our collective efforts, the CSA is the primary source of funding for the programs and ministries directed by our bishop, providing support to our parishes as well as most of the special national and international collections typically taken up as second collections in other dioceses. 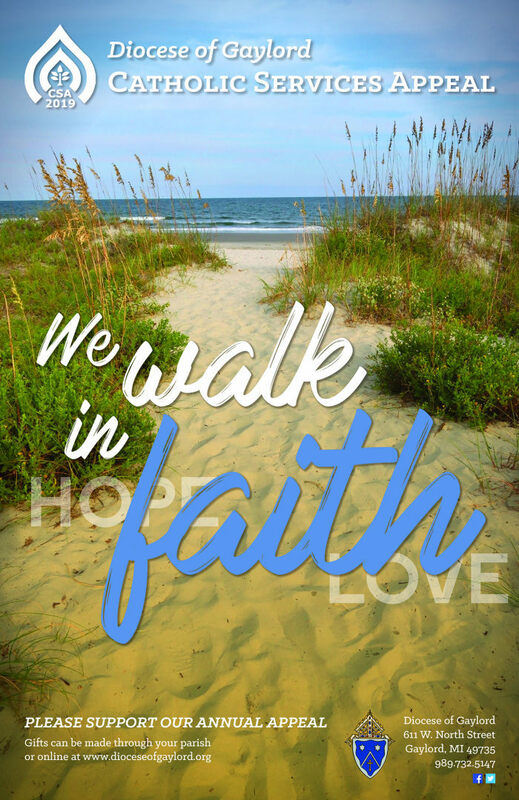 Our theme for CSA this year “We Walk in Faith”, speaks to this great journey we are on together; a journey of faith, with the promise of hope, in the sharing of love for one another. CSA allows us to reach across parish boundaries, tying us together through a common thread of attending to the needs of our parishes, our parishioners, our diocese and to the people of Northern Lower Michigan and beyond. Every year, parishes are asked to make a just sacrifice through a CSA target that is determined by both parish count and ordinary income. Any funds received over the parish target are returned to the parish 100% for local needs and good works. The purpose of the CSA is to help provide the funding necessary to carry out the mission of the Catholic Church—to build our families, our parishes, our diocese and our world into that faith community whose compassionate ministry to humanity embodies and witnesses to God’s power. The CSA supports services and ministries, some of which attend to needs that are beyond the scope of any individual parish. Some exist for the sole purpose of assisting parishes in their mission to teach, evangelize and provide good liturgical experiences. It is important that we recognize both aspects of the appeal. Below you will find additional information about what the appeal supports, the 2019/20 budget, parish promotional materials, a campaign manual, and convenient ways to give. If you have any questions about the Catholic Services Appeal, please contact the Diocese of Gaylord at 989.732.5147. Thank you for the many ways that you support the Church by embracing a life of discipleship, most specifically, through your gift to the Catholic Services Appeal. May you find the gifts you make, in gratitude for God’s abundant blessings, to be a source of great joy. Thank you for the continued support to your parish and to the Diocese of Gaylord. We hope that you find the gifts you make, in gratitude for God’s abundant blessings, to be a source of great joy. If you have a particular intention you would like to share with Bishop Raica, please complete a Prayer Intention Card and return to the Bishop’s Office. Use the prayer intention card below or one can also be found as part of the CSA pledge envelope in the May/June issue of FAITH Magazine. We ask that you keep Bishop Raica, as well as all of our priests, religious and lay leaders, in your prayers as well. Together, let us walk in faith with the Lord. As you know, CSA supports the work and mission of our diocese, which includes essential services for our parishioners, our community, and our Catholic Schools. Similar to how your regular offertory supports Holy Family Parish, the gifts we make to CSA support the offices within the Diocese of Gaylord and the many vital ministries and ongoing work accomplished at the pastoral center and throughout our Universal Church. Below you will find information about the Catholic Services Appeal; why it is conducted every year, what this appeal supports and why you should give. Please take the time to prayerfully consider what you are able to give to support CSA this year and consider a pledge that will be paid off over several months instead of a one-time gift. This allows most people to be a little more generous, instead of just giving what they can spare during the time of our annual campaign in May. Stewardship is a response to God’s generosity in our lives, which is not just a once a year thing. It’s giving from our first fruits, not our leftovers. Like other long term monthly commitments we make in our lives (our phones, gym memberships, and other material things), consider what you might be able to give to CSA this year by spreading it over 10 monthly payments. 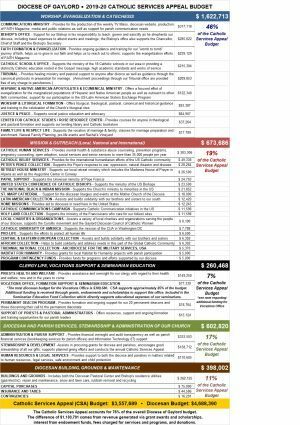 How are CSA funds used by the Diocese of Gaylord? The Catholic Services Appeal accounts for 76% of the total budget for the Diocese of Gaylord of $4,688,390. The difference of $1,130,701 comes from revenue generated via grant awards and scholarships, interest from endowment funds, fees charged for services and programs, and donations. Funds ten specific areas of ministry directed by our Bishop, providing support directly to our parishes, schools and to the people of our diocese. Provides funding for twenty different collections, supporting the local, National and International outreach efforts of the Diocese of Gaylord. Supports the health and welfare for our clergy, the ongoing formation efforts of the Vocations Office and support to our seminarians, Deacons program, as well as the ongoing formation of our Priests and Pastoral Administrators. Provides financial oversight and audit transparency and support to parishes (financial services, human resources, legal support), Information Technology, as well as efforts in the areas of Stewardship and Grant Writing. Supports efforts in the stewardship of our physical buildings, maintenance expenses, utilities, insurance and necessary capital purchases. Please refer to the CSA Budget Poster for detailed descriptions and specific budget amounts within each area. 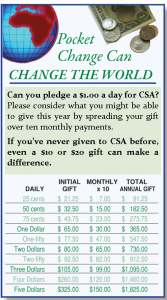 A Dollar a Day for CSA! Consider the price of a cup of coffee, or the price of one spin of a casino wheel…a small sacrifice can mean big things for your parish! If every parishioner in our Diocese found a way to pledge 50 cents or a dollar a day to CSA then every parish in our Diocese would go over target! Think about the needs that could be met in our own parish with monies given back to us from the Diocese for going over target! Please take a moment to prayerfully consider what you are able to give to support CSA this year and complete your pledge card during one of the parish appeal weekends. Every gift, regardless of the amount, is very important to the success of the Appeal. The vital ministries of our Diocese continue only with your help. Your gift of any amount will be gratefully received and deeply appreciated. How do I make a gift to CSA? This year, pledge envelopes were distributed in May throughout the Diocese of Gaylord, found within the Spring issue of FAITH Magazine. You have the option of making a one-time gift or a pledge. Pledges can be paid in-full at a later date or through regular payments indicated on your card. Please call 989.362.3162 or email holyfamily@hf-sh.org to request a pledge card. Feel free to use either of the above pledge forms and return with your pledge/gift to the parish office either by mail, dropping off in person, or placing in the offertory basket. Making your donation online is very easy. Simply CLICK HERE and you will be redirected to the Diocese of Gaylord website – be sure to DESIGNATE Holy Family Parish – East Tawas as your parish. Thank you for your giving hearts and prayers for the Diocese of Gaylord and to CSA! Need help making your gift or pledge? CLICK HERE to learn more about the Catholic Services Appeal on the Diocese of Gaylord website. Almighty God, we thank You for all the gifts You have given us: our lives, our loved ones, all that we have and all that we are. Most of all, we thank You for Jesus, Your Son and our Redeemer, who came among us to show us the way to eternal life. Jesus was the perfect steward of Your gifts, showing that complete trust in You is necessary, and that giving of self is a most important part of following Him. May the offerings of our time, our talents, and our material resources be made in the same spirit of sacrifice that Jesus taught us by His life and death for us. Amen.